Glasgow Warriors will pore over video footage of Ulster ahead of their Pro12 match at Scotstoun next Saturday. Ospreys displaced Glasgow at the top of the table as they in Swansea, hampering the Warriors' chances of a home play-off semi-final. 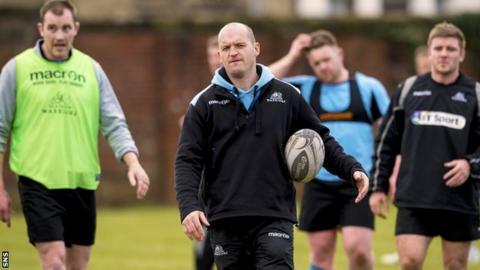 "We always learn whether we win or lose," Glasgow head coach Gregor Townsend told BBC Scotland. "Ulster are a really good team and we know we'll have to play better than we did tonight to win." Townsend was "disappointed" at his team's second-half display in Wales and promised to review the match before the flight home on Saturday. His team need a top-two finish to enjoy the advantage of a last-four tie in Glasgow. Third-placed Munster visit fourth-placed Ulster on Saturday in their penultimate game before the play-offs. "We will train hard next week and will look at how we can beat Ulster," he said. "They are a quality side, like the other three sides that are left in the play-offs, so we'll have to be better to win. "It's up to us as coaches and players to find out chinks in their armour or things that they like to do that we can take away from them." Against Ospreys, a penalty apiece meant the teams were locked at 3-3 at half time. But Glasgow fell behind to Ben John and Rhys Webb tries and, although Chris Fusaro went over from a rolling maul, a Dan Biggar penalty kept Ospreys in control. "We knew we were coming to a very good opponent who were highly motivated and played better than us on the night," said a dejected Townsend. "We did some good things in the first half. Going in at 3-3 I think both teams would have felt they could have scored a try. There were a couple of breaks for either team. "Giving away a penalty early in the second half when we had control of the ball was disappointing and when they got the breakthrough for their first try it was hard to come back. "When the weather is poor it's hard to get back into the game unless you are forcing things, which we did, and we made errors at times. "Ospreys controlled the ball better and they deserved to win. "There are a lot of things we have to improve. We need to do things better as a team. Individually we've got to make sure we don't give up easy ball to the opposition."